It’s arguably the biggest high school football game to be ever be played in the state of Nevada and also nationally in the past decade. Defending national champion and current USA Today No. 1-ranked St. John Bosco (3-0) travels to Fertitta Field on Friday night to face No. 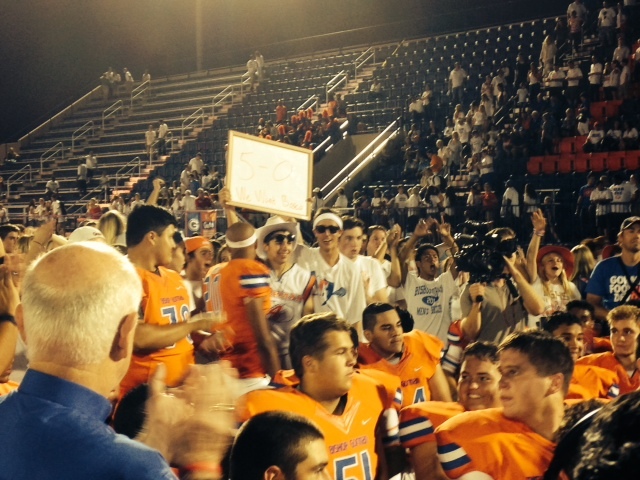 2 Bishop Gorman (5-0), winner of five straight state titles. The 6 p.m. contest will be nationally televised by ESPN and is a sellout. Expect plenty of TV crowd shots of celebrities like Snoop Dogg, Flava Flav and UFC Chairman/CEO Lorenzo Fertitta who are all regulars at Bishop Gorman games. But this contest also features some of the bluest of the nation’s top blue chip recruits and is a dream matchup for recruitaholics around the nation. Let’s start with the quarterbacks. 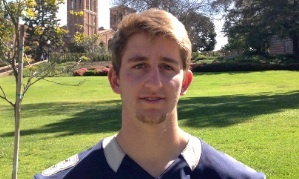 St. John Bosco’s Josh Rosen (6-foot-4, 205 pounds), who has already inked scholarship papers to enroll early at UCLA and is the likely heir apparent to Heisman Trophy candidate Brett Hundley, is rated the No. 1 overall prospect in the nation by longtime national talent scout Tom Lemming of the CBS Sports Network’s Lemming Report. “Matt Stafford,” Lemming, who has been criss-crossing the nation for almost 40 years interviewing and evaluating prep players, said when asked whom he would compare Rosen to. Then you have Bishop Gorman sophomore Tate Martell (5-11, 170), an explosive scrambler with a strong arm who has been compared to former Heisman winner Johnny Manziel. He made national headlines when he verbally committed to Washington … before he entered the eighth grade! Martell came off the bench to replace season-opening starter Danny Hong to lead the Gaels to a key early season road win over No. 24 ranked Servite High of Anaheim, Calif., completing 9-of-15 passes for 154 yards and three touchdowns and also rushing for 115 yards on 10 carries. He said that he is still committed to the Huskies despite an offer this week from USC’s Steve Sarkisian, who was the head coach at Washington when the Huskies offered. 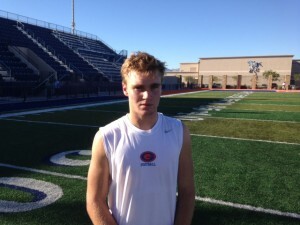 Bishop Gorman TE Alize Jones (6-5, 230, Sr.) – Lemming ranks Jones the No. 1 tight end prospect in the nation. He won’t get any argument here. I was lucky enough to cover a couple of future NFL stars in Tony Gonzalez (Huntington Beach) and Marcedes Lewis (Long Beach Poly) during my days at the Long Beach Press-Telegram and I would definitely put he UCLA-bound Jones in that class. 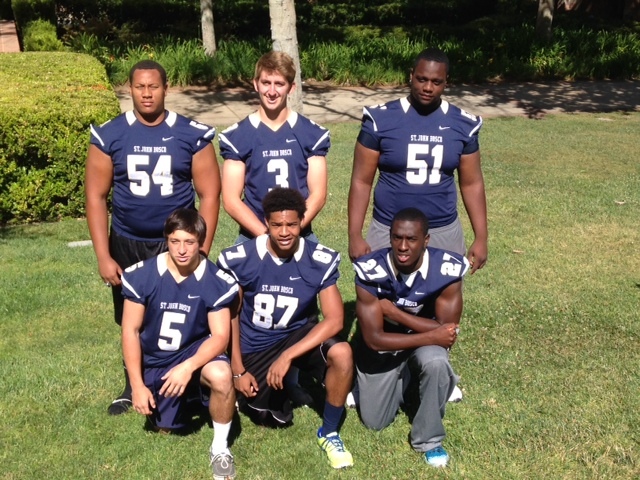 St. John Bosco OG Zach Robertson (6-5, 315, Sr.) – Arguably the top offensive guard prospect on the west coast. Has offers from everyone from USC and UCLA to LSU and Notre Dame. 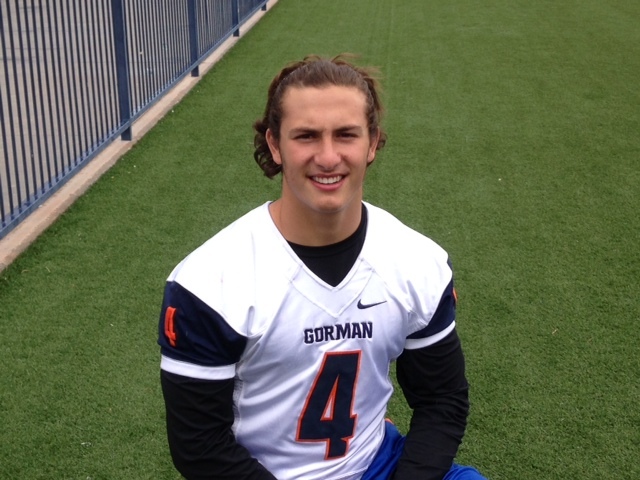 Bishop Gorman SS Nicco Fertitta (5-10, 180, Sr.) – The Notre Dame commit is the hardest hitter I’ve covered since Mark Carrier (Long Beach Poly) who went on to win the Jim Thorpe Award at USC and now is the secondary coach for the Cincinnati Bengals after an NFL career that spanned over a decade. Usually good for a couple of “wow” hits per game. St. John Bosco RB Sean McGrew (5-7, 175, Jr.) – Forget the height – Maurice Jones-Drew is also only 5-foot-7 and turned out okay – McGrew already may be the top running back prospect on the west coast with schools like BYU and UCLA already pushing hard. Ran for 2,076 yards and scored 23 TDs as a sophomore, including 367 yards on 17 carries and seven touchdowns against Corona (Calif.) Centennial. Has been electronically timed at 10.64 in the 100 meters. Bishop Gorman WR Cordell Broadus (6-2, 175, Sr.) – The son of rapper Snoop Dogg isn’t a blazer but makes up for it with his blocking skills, route running and ability to make the big play. Has over 15 scholarship offers including UCLA, USC, Notre Dame, Florida State, LSU and Baylor. Bishop Gorman WR Tyjon Lindsey (5-8, 165, Soph.) – Simply put, has been electrifying at times, running back a punt 92 yards for a game-changing touchdown at Servite and catching TD passes of 80 and 48 yards in last week’s win over Santa Margarita. Got offered this week by USC and also has been offered by Washington. 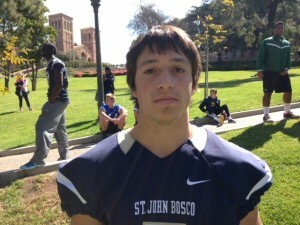 St. John Bosco OL/DL Tavita Moe III (6-4, 345, Soph.) 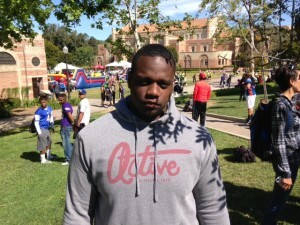 – Some believe that Moe, who played as a freshman at Silverado High School, has the potential to be the top line prospect on the west coast before he’s done.